GIIIRL, you SLAYED it for the gala. I loved your dress and golly your hair is amazing. Such beautiful curls so cool they lasted until the 2nd day! I didn't watch the Oscars but I do agree, Theron looked amazing. And of course, YAY LEO! Oh my goodness!!! Was there a red carpet there and I'd say yeah Charlize for the Oscars best dressed but BIANA for the Gala BEST DRESSED!! 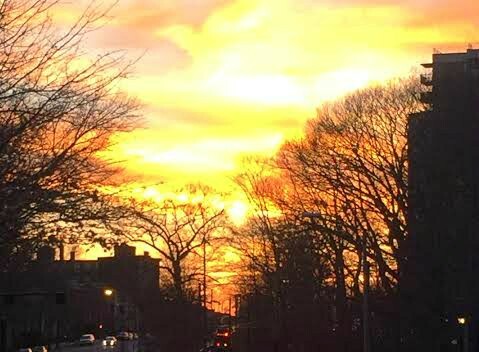 Happy Monday beautiful with the most gorgeous hair in all of Boston!!!! So glad you found a your hair is so pretty, so glad you found The Guy! I will have to give Fuller Gouse a try, totally not binge watching at 24min! Glad you had a great weekend and happy Leap Day! Your hair looks great! Yay for finally finding a hair stylist--it's always so hard to find someone that you feel comfortable with! We watched all of Fuller House too! I loved it! Charlize looked stunning and she was definitely a contender on my best-dressed list. Looks like you had a wonderful time at the gala! You guys looked so fab at the gala and your hair was beautiful! I think you definitely found your guy. I still haven't had a chance to watch Fuller House yet but can't wait to find the time hopefully tonight! I need to watch Fuller House! You guys look great all dressed up, and your hair is so pretty! Looks like a fun night! Your hair looks so gorgeous! What did you think of Fuller House? I've been hearing mixed reviews! You looked stunning in that dress!!! Love it! I also though Charlize was on point last night. I am also obsessed with Guliana Rancic's first look (the yellow dress). Your hair looked gorgeous and perfect with the dress. The weather was amazing, I took to the hiking trails, finally! We watched all of Fuller House this weekend too, I mean...how can you not?!?! Your hair looks beautiful and you are looking seriously fierce in that dress!!!! And right now I am really wishing I had that food, it looks so good! Hope you have a great week! You look absolutely beautiful friend!! I’m so with you on 2nd day hair. Why can’t mine ever look that good when I do it??? Omg girl your hair is so gorgeous, that is definitely a sign of a good salon when your hair stays just as fab the next day! Also how awesome do you guys look all dolled up for that gala! I've partially binge watched Fuller House and I swear the nostalgia isn't wearing off! Hope you have a wonderful Monday! 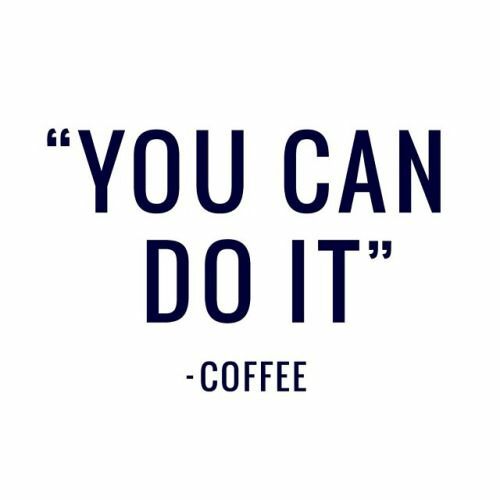 I totally need that you can do it - coffee quote in my life today. It's been a struggle today! I watched one episode of fuller house.. not sure what I think yet! um your hair looked amazing!! you guys all fancy - i love dressing up every so often and i swear there is just something about a good blowout and style! and so glad you guys got some of the amazing weather yesterday - it was just impossible not to be outside! I love the dress that you wore to the gala! And I still haven't watched Fuller House because I was out of town this weekend, but I'm looking forward to bingeing it sometime this week! You looked absolutely STUNNING for the gala! Your hair was GORGEOUS! And I totally agree-Charlize and Rachel McAdams were really the only looks I LOVED! Omg your HAIR 😍 Soooo gorgeous!!! your hair looks gorgeous!! how fun to get all dolled up for such a worthy cause!! Love it when my hair lasts a few days after a blow-out, so pretty! I was never a big Full House fan (I know that's an unpopular opinion) so I haven't watched the reboot, but almost all of my friends did! Looks like you guys had a really fun weekend! 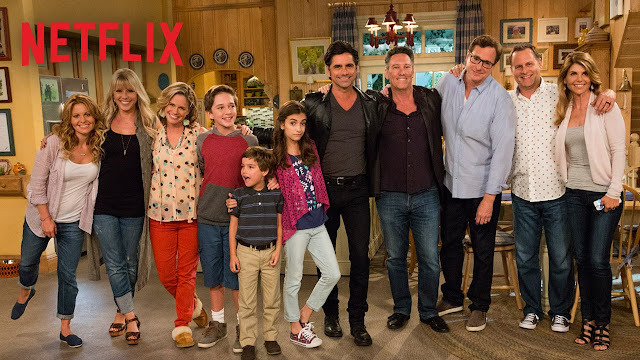 I also finished Fuller House - what did you think? I saw a lot of people didn't like it, but I personally loved it! Your hair looked fab - I hate when I get curls (I have naturally curly, but get keratin treatments and straighten) for an event and they are too high - yours were perfect! You seriously have the most gorgeous hair - so jealous! And I honestly thought a good bit of Oscar night was underwhelming - aside from Leo's win! Happy Monday! Oh my goodness, you looked so gorgeous at the event that y'all went to! I know what you mean about having a hard time finding a hair dresser that you love and can trust, but it looks like you might have found the one! I can't wait to watch Fuller House! We didn't have a chance to watch it this weekend, but it sounds like everybody loved it! You hair looks sooo gorgeous!! I can't wait to check out Fuller House! I'm waiting to start it until I finish Happy Endings haha! Charlize was gorgeous! Lady Gaga was my Red Carpet fav! Sounds like such a fabulous weekend! Your hair looks gorgeous! So glad you finally found a hairdresser, I had the same problem when I moved to DC! Such a relief when you find a good one! Happy Monday! You hair looked beyond amazing! Finding a good stylist is SO important-it looks great! I love balayage and on your head of hair I can't imagine how great it would look! The ATM in the salon is a great idea too. You looked beautiful for your event- loved that dress and yes yes yes to second (and third day) hair--love when the girls at work do mine because it lasts so long! Have a great week! I haven't watched the new series Fuller House yet, but then again I didn't watch Full house either. Your hair looks gorgeous! I saw some of the pictures of it on instagram or I feel like I did. He did such a great job! If only my hair held curls like that. Your breakfast looks so delicious! We didn't watch the Oscars, completely forgot about it! But I heard Leo finally got that oscar haha. You looked absolutely gorgeous for the gala! Your hair came out amazing!! Love the curls on the second day! I had no idea Clery's served brunch! Good to know. I usually go to the brownstone's. Happy Monday. Your hair is already gorgeous and he did such an amazing job, I love when second day hair is just as good as first day hair! Ha! Love that dress and the color looks amazing on you! You looked fab for the Gala! It's funny because I went to a gala too this weekend! Must have been the right weekend for it! Your hair, your dress, everything! Gah! Love! I missed Fuller House this weekend but hoping to catch it on the treadmill this week. Your hair! YES GIRL... YES! I love when curly hair rocks in waves the 2nd day. I love Fuller House! I'm on episode 8 & love it!!! I was a bit underwhelmed by the dresses - but Charlize's dress was one of my top picks. Your hair looks fabulous - looks like you found the perfect stylist! I have yet to watch Fuller House but I'm hoping to start that tomorrow. Loving your blog so much!! I meannnn, your hair is #hairgoals! Gorg!! The gala sounds so fun and you looked gorgeous! I love how your hair turned out and the color of your dress is so pretty. Second hair day is the best right? Mine does they same thing and it stays curled for couple days. Sunday brunch was a good idea...we did the same! I love the hair! Looked fabulous both days. You looked gorgeous at the gala. Yesterday, I had some tater tots that looked a lot like yours. So yummy! Holy hot stuff! Girl you look amazing! That 2nd day hair makes me envious. :) glad you had such an awesome weekend!! Love your hair and dress for the charity event girl. Can't believe your hair looked that good on the second day! Haven't watched Fuller House yet but cannot wait to binge watch it this upcoming weekend as I have nothing planned. I agree Charlize Theron slayed it in Dior. Your hair looks great on day one and day two. Like fab! Oh my goodness, you looked stunning for the gala! Your hair was fabulous - look at those second day waves! I can't wait to watch Fuller House, but we have a full DVR to catch up on first after vacation. I agree with you about Charlize at the Oscars, she always nails it. You look stunning in your gala pictures! And your hair was on point... I only wish I could keep curls for two days! I'm lucky if I can keep them for two hours! Haha. And Charlize was by far my favorite as well... I need that dress for our ball next year! Holy hotness!! Your second day hair looks just as good as when you were in the salon! I He did an AMAZING job! I hope that one day I can have a "spot" like that – where my husband-to-be and I have cute stories. And the food look amazing, too, so that's even more of a plus! You looked beautiful! Getting gussied up is the best! Sounds like a fabulous weekend! your hair looks amazing, and you should wear that dress everyday because it was amde for you. i love the movie leap year, i might watch it tonight. so adorable! Um well hello gorgeous!!! You looked absolutely breath taking at the gala! And your hair!!! So so pretty! Pretty sure Fuller House binge watching is in my future for sure! I made it through 8 episodes of Fuller House and I'm going to be so sad when I finish! Love the hair!! That gala looked so fun! You look absolutely stunning in that dress and I LOVE your hair! I'm embarrassed to admit how infrequently I wash my hair. Like I think maybe twice a week. Gross, I know, but I don't have time for all that styling daily!! beautiful hair!! And yes, don't get me started on scissor happy stylists. Drives me NUTS. Looks like a super fun weekend!!! Your hair looks fab on all the photos! And yes, when you find the right stylist it's like the Heaven's open up and the angels sing, haha! Glad you guys had fun at the gala! Okay, where do I begin because there's so much fabulousness going on in this post! First, you look absolutely stunning and you both would give any celebrity couple walking the red carpet for the Oscars a run for their millions! You're gunna laugh, no lie did I say yassss girl out loud at the second day hair shot, babe you are such a beauty (I love olive on you)! I've heard of Fuller House, but I guess I'm just being a stubborn and proud '90s kid in refusing to see it because "it's not the same." However, you sparked my interest because most of the cast seems to be there, except for the Olsens :( Thanks so much for sharing, I always love these kind of posts from you! Have a wonderful day and start to the week, girlie! I hope you made best dressed list at the gala! ;) And 2nd day hair for the WIN! Yes, please! I think I'm the only person on the planet who didn't watch Fuller House yet haha ;) Jared and I definitely plan to soon, I can't wait!! Your hair looks INCREDIBLE on day 1 and day 2, so glad you found a 'keeper' stylist- that is such a huge choice, I get it haha. It took me forever to find my girl! I can't get over how gorgeous your hair looks-- both days! I haven't watched Fuller House yet, but I'm sure I will soon and I'm with you feeling underwhelmed by the Oscars fashion this year. You looked amazing at the gala-love the dress and the hair! I laughed when you said your hair doesn't look as good the second day because of no patience because that is so me! Haha. Trader Joes flowers are always amazing! love the hair and of course I'm a Fuller House Fan Girl. Ok, you officially win most beautiful weekend hair!!! Both days! Beautiful hair (both days)...and are those tator tot nachos??? Because I'm drooling right now!!! We definitely watched all of fuller house too and I didn't even feel bad because same thing - the episodes were so quick! Your hair looks fabulous and you guys look so great for that event! wow you had such a productive weekend. I need to see fuller house. I grew up on the originals, but im sure this will be good too. your hair looks gorgeous and your outfit to the gala was so pretty. happy leap day! I have a confession.... I was never a die hard Full House fan. Sure I knew all their names, story line, etc, but I really thought it was cheesy. haha. However, I totally fell for Fuller House, and I love Candace Cameron! Love your gala dress and hair! He's totally your stylist, especially with how it looks on the second day. Book your next appt now! WELCOME BACL BIANA! SO SORRY I HAVE BEEN MIA BUT I HAVE BEEN SO BUSY. I will do a lot of catching up with you this weekend. I love your hair and you look divine in the purple gown. ALSO THE FOOD AND FLOWERS LOOK AMAZING. And I agree Charlize looked the best, she always does!